As I said I am setting up the QA game for my experimental randomized Pathfinder game, which as you can probably guess from the title I am calling Crisis in Chandar, Chandar of course being the town the adventure is set in. I'm still having some issues with image hosting that I'm trying to work out as I type this, but hopefully I'll have things straightened out sooner rather than later. The river town of Chandar is a community of mostly humans, with roughly 600 of the 800 something residents being human. Set against the Hazel River this community is mostly fishermen, ferry captains who handle taking lumber to port and bringing back other goods, and lumberjacks who harvest lumber from the nearby forest and work the lumber mill. Many of the laborers live in a cramped and derelict corner of the town while the river barons, merchant princes, and other "nobles" live in far nicer lodging in the other end of town. Chandar has one inn, a smith, stables, and general market areas all set up around the central fountain, as well as the barracks and armory set up for the guards, of which there are maybe 3 dozen full time guards, with 12 guards working 8 hour shifts to keep the peace and patrol the area. The walls around the city are mostly to keep the local wild life out, though also serves as a simple watch post from the various platforms along the inside. A guard with a bow can keep watch and frighten away most wild creatures with a well placed shot. Posted on 2018-01-24 at 21:34:39. Our ragtag group of characters, all coming to, or passing through Chandar for their own reasons have decided, at the pleading of multiple posted notices for help to meet with the Captain of the Guard, Jirolin, to determine just what sort of assistance the town needs. They are informed that recently someone or something is supplying a dangerous drug, Flux aka Magic Candy, to residents of the small river town and the side effects are unpredictable and apparently sometimes fatal. That latter point they quickly witnessed to be quite true when a prisoner they were attempting to interrogate had his eyes and tongue explode in his head. Posted on 2018-01-24 at 21:35:50. Jirolin Urtius: Jirolin is a human standing just under 6 feet tall, and Captain of the Guard in Chandar. He provides your characters with information as well as "Watch Medallions" in order to get you started on your quest. See below, but older with some grey to his hair which is also a little longer, and indigo for the clothy bits rather than the brown this image has so much of. Posted on 2018-01-24 at 21:36:21. The Two Moons Inn: The Two Moons Inn, the group has been informed, is to be their unofficial base of operation within the town, room and meals to be provided by the owner, Wynna. Though they have yet to visit the Inn or interact with the owner, this is sure to be an important spot where many hours will be spent. Posted on 2018-01-24 at 21:37:15. Adamo Ulfa: Deceased prisoner, died during interrogation attempt. Posted on 2018-01-24 at 21:38:07. Iaka Arona is a Ratfolk Fighter (Cad Archetype) who rides a Giant Rat, played by Schnozzle. The Card influencing this Meteor Hammer wielding Cad was Nezumi Cutthroat. Iaka appears to have a bit of a temper, seems prone to outbursts, and displays a disregard or perhaps even contempt for authority figures as evidenced by his interactions with the sickened guard after Adamo's gruesome demise. He does not show any aversion to using intimidation tactics either judging from the fact his first instinct was to brandish his weapon when trying to interview the prisoner. Posted on 2018-01-24 at 21:38:51. 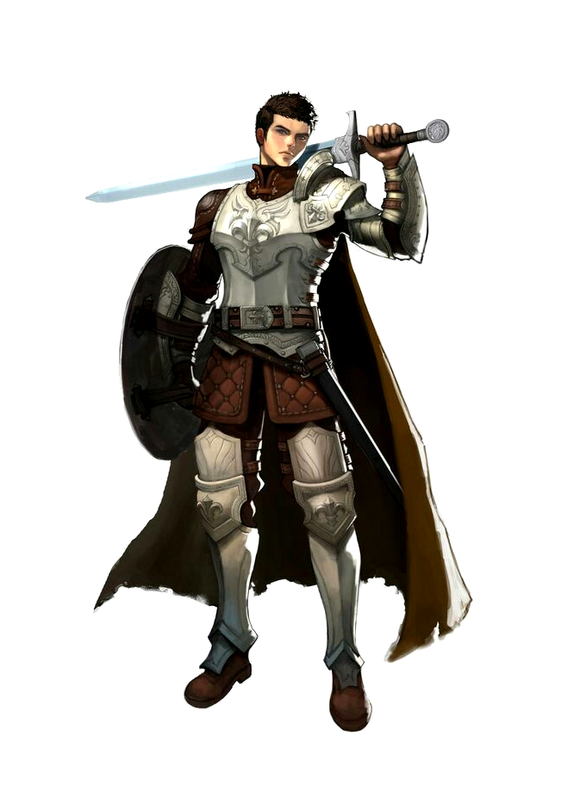 Asoel is an Elven Ranger specialized in quick attacks with a spear, played by Decicio. The Card that influenced this character is Norwood Ranger. Fun fact; the woods that the people of Chandar do their logging in has been dubbed Norwood because this card was drawn and it seemed fitting to integrate this into the world itself. Asoel seems less enthusiastic to deal with people and seems out of his element and perhaps even a bit uncomfortable being back among Human civilization. He does also seem to possess a surprising amount of knowledge for such a "young" Elf, relatively speaking. His keen senses are always scanning the surroundings though and taking in details other less observant companions may overlook due to the breakneck speed at which the shorter-lived races live their lives. Posted on 2018-01-24 at 21:39:06. Yanyeeku, or simply Yan, is a Kitsune Witch with a Flying Squirrel familiar played by Chessicfayth. As it stands however the group has only seen Yan's human guise and are unaware he is a Kitsune. In order to diversify the character (make him non-human) this character was generated by random rolls rather than a Magic Card. BTW Chess, if you have a particular image you'd like posted seeing as how everyone else has their card here, let me know and I can add it. Yan has brought a sense of mystery to the group, first with the revelation of the drugs magical aura, and later again with the reveal of his familiar and patron to the group. It is clear the group will likely have to rely on his magical expertise in dealing with the more mystical aspects of the drug and their investigation. Posted on 2018-01-24 at 21:39:17. Kheric is a Dhampir Swashbuckler played by Nomad D2. The Card used to influence this character was Nirkana Assassin. As with all of these PC Detail posts, details have been left vague on purpose. Despite his clear heritage Kheric seems to be the most compassionate member of the group and has taken reluctantly to the role of "face" doing the talking. Even if his words fell on deaf ears, literally, it was clear in his pleas with Adamo that he wanted to help the poor soul improve his lot. Either that or he is simply charming and deceptive much like his vampiric ancestor and using his honeyed words to get what he wants, only time will truly tell. Posted on 2018-01-24 at 21:39:23. While this adventure may be focused around a single town I've decided I will be posting the world map as well as other information about the world as your characters would likely have a better knowledge of the world outside Chandar than they do about the town itself. Chandar is the dot beneath the lower river next to the large forest (the raised green area) the dot at the mouth of the river is the port city of Thornapple (a Large City) where most of the sea-based trading takes place, barges travel up the river, making a stop at Chandar usually before continuing up river and through the mountain pass on to the Capital of Alabaster (the white square with a silver X), the only Human Metropolis on the continent (for those of you who had metro homelands in your backgrounds). The Village of Rocperch is the dot along the mountains that line the Eastern Coast, situated within a hollow in the range reachable through a cramped ravine passage, Rocs are especially prominent in these parts, nesting in the mountains above the village. The Forest that dominates the northern edge of the continent is known as the Sylvan Woods and is home to Elves, Fey, and those they see fit to allow to stay. Powerful, wild magic runs rampant within its borders, and the great Elven Metropolis of Myrtheplith (Honoured of the Forest in the common tongue) stands deep within the woods as a bastion of knowledge, art, and beauty. The settlement to the far south, Stonewater, is another settlement similar in size to Chandar that specializes in fishing the dangerous frigid waters. That patch of blue and black is a swamp, in case you were wondering. South, beyond the treacherous stretch of frozen ocean known as the Sea of Shards, lies a frigid continent much like our own Antarctica, where only the hardiest of people choose to live among the dangerous denizens of this unforgiving tundra. There are no permanent settlements, tribes move with the food and settling for too long is not an option. The desert continent across the sea is barely fleshed out at this point as neither of the games I am running in this world have had reason to go across the sea to the barren desert lands beyond. It is a land of hot sands, blistering sun, and scorching winds run by trade princes who have found ways to capitalize on various resources such as oil, valuable minerals found within the sands, or even relics of long lost civilizations. Slavery, while uncommon in the lands of the green continent (I haven't come up with names for the continents yet), is quite common across the sea, and in fact few blink an eye at the idea as it is all they have ever known. Posted on 2018-01-24 at 21:39:29. Posted on 2018-01-24 at 21:39:40. Posted on 2018-01-24 at 21:39:45. Posted on 2018-01-24 at 21:39:50. Posted on 2018-01-24 at 21:40:06. Feel free to post any questions, comments, or brainstorms! Posted on 2018-01-24 at 21:40:54.